Apologies, for the the use of phrase du jour, ‘bromance’, in the title of this review. But at the moment Hollywood – and it seems cinema-going folk such as yourself – can’t get enough of the ‘Bromantic Comedy’. A newly titled genre that describes a meeting of boy with boy/s, for fun and games, which culminates in the suggestion that the main characters live in each others arms from here until their dying days. But not in a gay way. The phrase is trite, it’s cheap, it’s silly but it kinda works. That last line is also a tired seagueway into describing ‘Hangover’. Hooray! 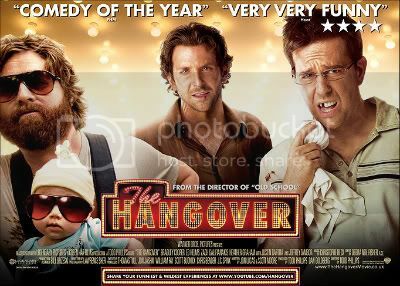 There isn’t a lot about ‘Hangover’ that should work. The plot is basically ‘Dude Where’s My Groom’. Its set in Vegas, the laziest scriptwriting location for ‘crazy’, ‘wacky’ times. It has a cameo from a famous sporting star. All signs point to the kind of comedy designed to make fans of ‘Step Brothers’ laugh. Yet implausably it works. Most of the kudos goes to the scriptwriters Jon Lucas and Scott Moore for writing some great set-pieces and some pretty memorable characters. That they’re not the normal, ‘we share a lot in common’ kinda friends adds to the humour tenfold. Yet it’s the personification of these characters by the main trilogy of actors (Bradley Cooper, Ed Helms and Zach Galifianakis) that really sets the film apart. Bradley Cooper finally lays to rest the ghost of being that ‘cunty one from ‘Wedding Crashers” with this role as the logical but reckless leader. Ed Helms expands upon his Andy from ‘The Office’ persona as the cuckolded weakling whose dark side appears after a whiff of alcohol. The breakthrough performance comes from Zach Galifianakis as Alan, a ridiculous creation that may cause an entire generation to distrust men with large beards. But he certainly gets the biggest portion of the laughs. And there are enough laughs to go round. They may never be anything approaching highbrow (Naked Asian Guy, Naked Old Man, Naked Alan) but as an empty headed, stupid and fun 90 minutes without any explosions or machine gun fights it may be the perfect summer film to watch the night after a skinful.